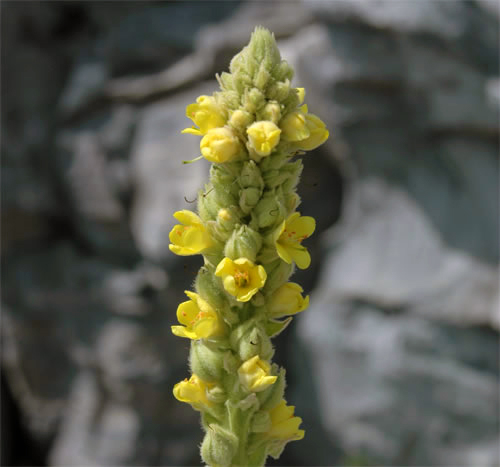 Common mullein, a biennial in the figwort family, is native to Asia. It was deliberately introduced to the United States in the 1600s as both a medicinal herb and a fish poison. Historically, it has been used to treat a variety of ailments ranging from coughs to earaches. Nowadays, it is grown as an ornamental garden plant. 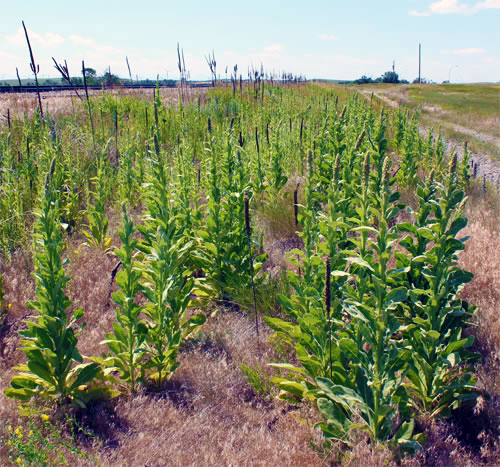 Common mullein can overtake and displace native species in disturbed areas, along roadways and railways. It is a difficult plant to eradicate due to the longevity of its seeds. Its seeds can remain viable for 100 years or longer. This plant may also serve as an alternate host for insect pests that feed on fruit trees. A key characteristic of this plant is that its yellow flowers are arranged on a single 20-50 cm long spike. Individual flowers are 15-20 mm wide and mature from the bottom to top in a spiral pattern. The leaves are covered in dense grey hairs making the leaves woolly and soft to the touch. 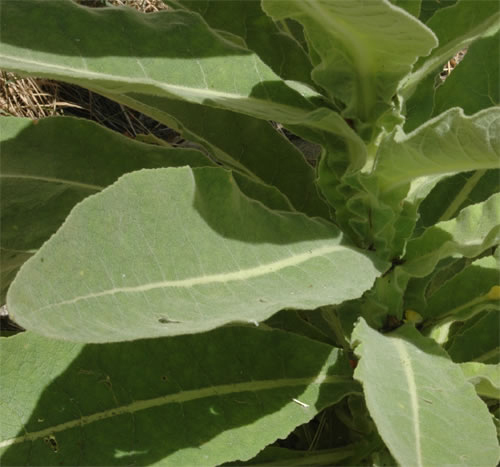 Upper stem leaves are alternately arranged with blades of the leaves extending down along the stem. The plant grows up to 2 m tall.